On Sunday evening, millions tuned in to watch the team everyone loves to hate (the New England Patriots, of course) make their ninth Super Bowl appearance in a 1:1 match-up against the Atlanta Falcons. For the first three quarters, it seemed as if the Falcons had “risen” and were on their way to take home the coveted Vince Lombardi trophy. The game took a turn, and lo and behold, Tom Brady and his band of bandits shut down the Birds with an overtime win. At first glance you may be thinking, “What does the Super Bowl even have to do with the TMF?” Let me just start by having you consider how a team even makes it to the Super Bowl. They obviously must play well enough to win several games to even make it to the playoffs, and then beat the best of the best to become the division champions. This Super Bowl was won by a simple formula of three things: preparation, coaching, and amazing players. Similarly, success (defined here as having an inspection ready TMF) requires a simple formula: process, people and a sustainable TMF medium (i.e. technology and/or paper). There are multiple regulations (e.g. ICH E6 2.10, Regulation (EU) No 536/2014 Article 57]) that provide clear instructions that the TMF must be contemporaneous with the clinical trial. Having a proven sustainable process can be the difference between scoring 28 points and losing, or staying in the game and being the champ. Or, the difference between having findings after a regulatory inspection or not. TMF process should be developed by a person or organization who not only understands process development and the TMF, but true, real-life experience in clinical trials as well. Process should include a way (e.g. TMF Set-Up, Document Quality, TMF Quality, Attend to TMF Health) to ensure Good Clinical Documentation Practice and Inspection Readiness on Day 1. – The influx of eTMF technology and service providers. It is vital to an organization’s success to have staff that are experienced in clinical trials and document recognition (and I’m not just talking about site level documents). It is imperative that the staff possesses keen attention to detail and the ability to make good decisions (a misfiled document is the same as a missing document). Historically, TMF positions in small-mid size companies have been combined with other roles (this is still the case today). In my previous life, I was a Project Coordinator at one of the absolute best CROs on the planet; one of our duties was to file TMF documents – in addition to all other important tasks. In football, the Special Teams unit draws from both offensive players and defensive players but its importance is such that it merits its own meetings, coaches and captains – even its own playbook. I could have used that Special Teams unit in the form of a TMF Group to file documents expeditiously without fumbles! As the TMF becomes more of a Functional Line (yes, it is and should be treated this way), the more organizations will ensure the presence of a standalone TMF Group within that functional line, or they will outsource to the right service provider. Just as Tom Brady and Matt Ryan led their teams to “the big dance”, so you want a well-developed team (NOT substitutes – remember the movie “The Replacements”?). Sustainable TMF Medium: Although there are over 20 eTMF vendors on the market (wow! ), according to the 2015 TMF Reference Model survey, 29% of organizations are currently using paper and a whopping 57% are in a combination of paper and electronic files. In football, it does not matter if the play is a passing play (i.e. the ball is thrown) or a running play (i.e. the ball is handed to a player and they run as far as possible), the ultimate goal is a touchdown. This is true with the TMF; in 2017, it is okay to use paper, an eTMF or a combination as long as there is clear documentation (the end zone, if you will) of where documents reside. TMF medium must be supported by process (not the other way around) and controlled and managed by TMF experts (again, not the other way around). Far too often we see organizations that have an electronic TMF following paper processes or a paper TMF following an electronic process. The TMF medium is vitally important to the overall success of a clinical trial, after all it is THE most important deliverable of the clinical trial (I know what you’re thinking … Yes, it IS!). 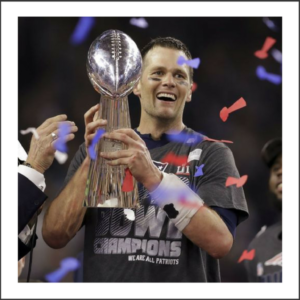 If the medium is treated as THE deliverable and not simply as a black hole to store documents, it will be given the respect it deserves and can help you win the Super Bowl (okay, obviously not, but it definitely ensures a successful audit or inspection!). If you want to have a winning TMF, you need to have the right combination to ensure that you too can be a five-time (or more) champion! This post is in no way a direct endorsement of the New England Patriots, but congratulations! That was definitely the BEST comeback EVER! !